Guts has arrived at Albion Monastery to find Caska, accompanied by the young Isidora. Though he finds Lucia and has a lead on Caska, he is too late. The cult who think Casca is their witch has already snagged her. Now he has to race against time to secure Casca before Farnesse and her Holy Iron Chain Knights raid the heretics lair. Worse, night is about to fall and the evil spirits that swarm around Casca will be searching for hosts. Franesse, her knights, and Guts are in for a fight as demonic spirits surge. And through it all, the eyes continue to watch and the tortures led by Mozgus continue to brutalize their captives. Evil builds at Albion as night falls. The trap has been laid and snaps shut. 19 is a wild ride. You are right there with Guts, so hopeful that he’s finally found Casca only for the cowardly Nina to ruin everything. Miura does a great job in this volume from the action, to Guts’s duel with Serpico on the ledge. The action is building as the various characters are all thrust into the crucible. Isidora shows his mettle, too. Then the real action begins. Miura has our characters in peril. He has you wanting to read more. Volume 19 propels the story forward and leaves you wanting more. I want to dive right into volume 20! 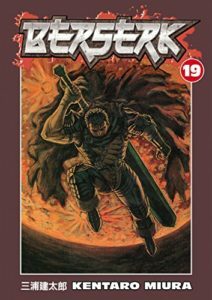 If you’re a fan of fantasy, you should check out the BERSERK graphic novel series! You can buy BERSERK Vol 19 from Amazon.